Timecrimes is the best time travel movie I’ve ever seen. Which seems like pretty high praise. There are lots of time travel movies out there: this isn’t a category like “best cowboy movie where the shootouts are replaced by drug trips” (Renegade) or “best cowboy movie where the shootouts are replaced by ramen noodles” (Tampopo) or “best cowboy movie that’s actually a t.v. show and set in outer space” (Cowboy Bebop – although if you want to add the stipulation “and isn’t a cartoon” then my answer would be Firefly). “Time travel movies” is a category broad enough that it probably takes more thought coming up with the answer than was put into delineating the category, as opposed to all the above. And there are plenty of reasonable entries: Donnie Darko, Terminator 2, Primer, Back to the Future, Groundhog Day. 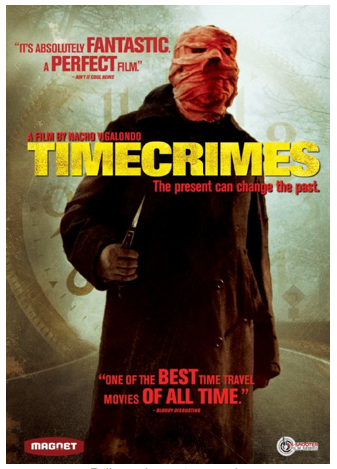 But I think Timecrimes is best. You should watch it, if you haven’t. If you like time travel movies. Maybe even if you don’t, or haven’t yet. Because, who knows, maybe you’ll still appreciate seeing the best. And you should watch it, if you haven’t, before you read this essay. Because you might be one of those people who likes to be surprised by things, or likes to experience a plot with your mind untarnished by expectation, and I can’t very well explain what’s so great about it without giving a lot of that away. Here, look, just to be extra kind, I’ll do some more dithering-style typing. So that your eyes don’t accidentally flit down and spoil things for you. After borrowing the movie from the library, I wound up quite worried that it would be terrible. Because often movie previews are for things that are vaguely similar to what you’re watching, right? Like, “if you liked this enough to rent / buy / borrow it, maybe you’ll want to see these other things, too.” And one of the previews was for (I assume I’ll have the names wrong for these, because I am actually writing this essay about four years after last watching Timecrimes – it’s that good! Sticks with you, man) a movie called like “Bus!” or something, about sorority women who couldn’t step off this bus or else they’d be attacked and killed, and one called “Quill!“, about a deadly porcupine? Something like that. And then the movie started, and it was terrible. Like, it felt unwatchably bad. But I switched the audio from the English dubbing (why would that be the default?) into the original Spanish and it was much better. Okay, that’s plenty of dithering. If you’ve read this far and still haven’t watched the film, you deserve to have it ruined for you. Timecrimes is great because it has this really serious message about information sets, and it conveys it in an interesting way, in the form of a puzzle that the protagonist has to solve. And there are some objections you might raise, as far as why you might think that the virtues described in the above sentence are insufficient to redeem the film. At least, K had these objections. So maybe you would have them to? I don’t know what kind of movies you like. • Why did the innocent woman have to die? This was what upset K most. But the thing is, someone had to die. Because the protagonist realized that the time machine was horrible, so there had to be extremely high stakes in order to get him to go into the machine again. This aspect lends a degree of nobility to his acts – the only reason he would have used the machine again would be to save his wife. • Why did he mimic all those horrible acts at first? Right, so, he chased and stabbed his past self after first going back in time. But only because he thought he had to. The time machine technician had convinced him that if anything happened differently on this trip through the time line, horrible consequences could occur. Who knows, maybe incongruity / destruction of the universe type consequences. So he was worried that he would disrupt things and tried his best to ensure that everything happened exactly the way he remembered it. It was only on his second trip back through time that he tried to change things. Because at that point his wife had been killed. So, in order to save her, he specifically tried to alter the past. For me, the movie progresses through three phases, all after he finds the time machine. In the first, he is afraid of changing anything and is trying to act in ways that reproduce his memories of the past. In the second, he is afraid that he won’t change things and that will mean his wife will die. And then, in the third phase, after he wakes up in the car, he has realize that he can’t change anything. He tried to, he failed, everything matched his previous memories perfectly. And it would make sense, right? If there were time travel, then everything should line up, because the inside of his brain is already in a certain state – he has these memories of what for him is the past, and what for other characters is the future – and so those thing must happen to justify the current state of his own mind. So then the puzzle for him to solve is, How can I be wrong? He knows that his wife will die. He watched it happen. He has a memory of it. So how can he change things so that falling off the roof does not actually kill his wife? Personally, I hoped he’d use his third trip through that stretch of time to put a mattress on the ground where his wife was going to fall. But I guess that’s because I’m a softy. I don’t like tragedy in art. Which is kind of crumby, because obviously good art is often tragedy. But the end-of-movie haircut seemed very clever. He knew his wife died because he saw a woman with his wife’s haircut fall to her death. But by giving that haircut to the innocent victim, he makes his own memory incorrect, and his wife is saved. But isn’t that enough? Isn’t doing one beautiful thing, presenting one thing in an interesting way, enough to make a great movie? Also, in case you were interested, the director does interesting things with information sets in the other film I’ve seen of his, Extraterrestrial. Like, information sets are the things you care about in game theory. Why, for instance, a car loses most of its value as soon as you buy it and drive it off the lot. Now you are privy to secret knowledge about how well it works, and a buyer has to make a guess in the dark. And, anyway, the fact that he’s making these movies seems cool to me – there are directors out there who seem to be fascinated by outlaws, or motherhood, or precipitous camera angles, or by jacket sleeves that don’t come as far down the wearer’s arms as most people think they ought to. Like, all sorts of things a director might obsess over. So isn’t it nice that there is also somebody obsessed with information sets?